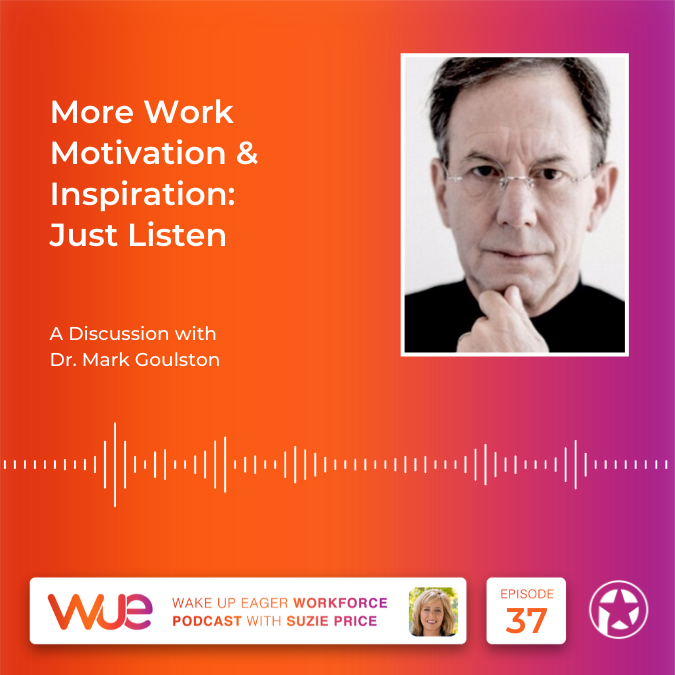 More Work Motivation and Inspiration with Just Listen Author Dr. Mark Goulston. Suzie interviews Dr. Mark Goulston. Something all leaders and mentors will want to know about - Tether Love. Find out about Oxytocin Deficit Disorder - It may be impacting your team! Get conversation tips for holding a Wince Conversation. Topic 1: Welcome; Getting to Know Dr. Mark Goulston. Favorite possession - Personal journal. Funny story - Garage sale. Topic 2: How Did Just Listen Become Your Focus? Why Does this Matter to You? Story about "Nancy" and how all those years ago, out of tiredness, you let go and were totally present with her and she started to feel less alone. Powerful. A demonstration of what we can all do with the people we are with. Topic 3: What Gets in the Way of Getting at This? Tactics shared around intending to connect, be a first class notice and be curious about what you notice and ask a question. What to listen for: I.C.U. = Important; Critical; Urgent. "The purest form of communication is to listen without memory or desire." P.A.L. = Purposeful; Agendaless; Listening. Topic 4: Can You Talk About the Brain Science Related to Listening in Layman Terms? What a great mentor does. Tether Love - Believe in and see their future and their goodness, tether them to the future you see for them. Homework assignment with specific 3 steps for thanking our mentors. 72 hour hold. (If I have a breakdown, sit with it - Don't drink, shop, blast people and you'll get the breakthrough). Topic 5: What Changes Have You Seen - As Leaders Have Become Better at "Just Listening?" What's the Impact on Their Personal and Professional Life? CEO exercise with 180 CEOs about sharing who had been there for them, stood up for them, stood by them in crisis. V.C.G. = Vulnerable. Courageous. Grateful. Topic 6: What Changes Have You Seen in People - As They've Built this Skill? What's the Impact on Their Personal and Professional Life? "Pains me to have this conversation..."
"I want to root for you..."
"...triggering a flashback... people have to work around that..."
Your billboard - "Forgiving creates space. Be more interested, than interesting. Be more fascinated, than fascinating."